Yesterday, Italian Catholic Mother came back from visiting my Aunty Dolly armed with pictures of my aunties as young ladies that had been recently unearthed. I love old pictures of my aunties, as they were all so glamourous with wide eyes and dark curly hair (my sister inherited their genes!). One of these days I'm going to have to post some pictures of them here, as they're an inspiring bunch. Having very little money, they often had to improvise with making their own outfits. My Aunty Mary for example worked in a theatre, and would often copy designs directly from what the stars were wearing. I'll save more interesting anecdotes for a whole post about them, but there was one photo that stood out of Aunty Dolly posing in a fabulous pale coat, hat and heels. Italian Catholic Mother had asked where she was going, dressed up to the nines, and Aunty Dolly replied simply: "Just to the shops. I didn't need an excuse to dress up!" POINT OF FASHION: No excuses! I finished off the look by having smoky dark eyes, and applying a slick of my favourite red lipstick - Fire by Chanel. So what else have I been up to over the past few days? 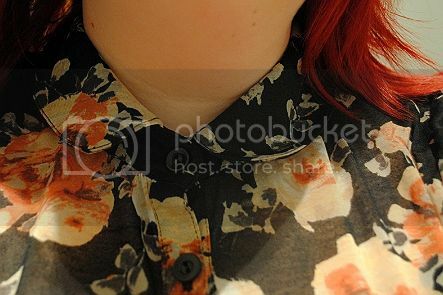 1: Miss Selfridge has some gorgeous peices in this season, and I'm especially in love with this 1970s inspired shirt. I felt very chic with it buttoned up to the neck, but I'm struggling to find anything to wear with it as I don't think I suit the cut of cigerette trousers, I never find jeans that fit properly and I rarely wear shorts anymore as I used to live in them during college and university. Hmmm. 2: "Oh Mickey, you're so fine! You're so fine you blow my mind!" 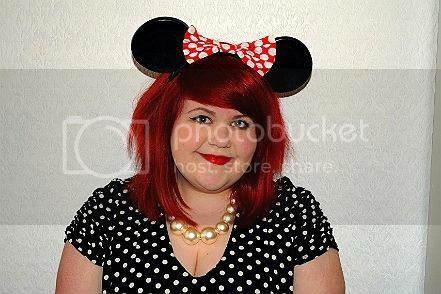 I was rooting around a cupboard and found my Minnie Mouse ears from a trip to Disneyland as a child. Can I incorporate them into my everyday wardrobe, please?! 3: Shock horror, I actually painted my nails this week! I'm far too clumsy and impatient to do nail art, so this is as exciting as it gets. 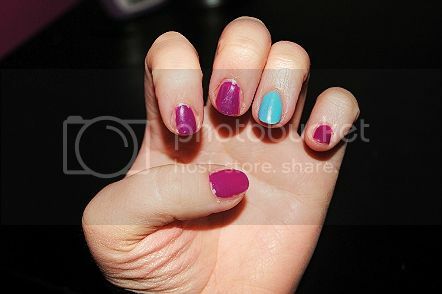 The colours are both by Barry M.
Finally, I've just this minute finished watching Lady Gaga's new video for Born This Way. It's interesting to say the least! I especially liked the introduction, which is incredibly theatrical and over-the-top (if pretentious) but the song still hasn't won me over. Of course the message is a lovely one. I really do respect her though for promoting individuality and constantly pushing the boundaries, especially as such a mainstream artist. For example, I really liked her egg stunt, and I guess the video is carrying on the (re)birth theme, right? Hmm. Oh, is it that time of week already? HOORAH! So who are we going to be squeeing and fangirling for over the next seven days? Amandah Wilkinson from Operator Please. I LOVEEEEEE this band so much - all of their songs just instantly cheer me up. 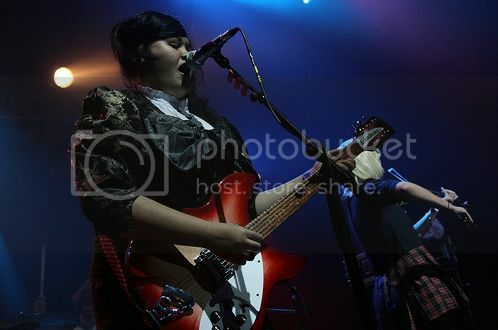 Amandah is the curvalicious lead singer and guitarist, with a cracking fashion sense and the CUTEST Australian accent. Songs to check out: Get What You Want, Just A Song About Ping Pong, One Yellow Button, Volcanic, Back And Forth. 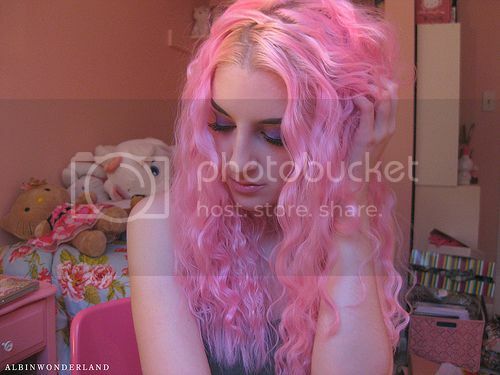 Milly is a gorgeous blogger and part-time model from Leeds (via London). 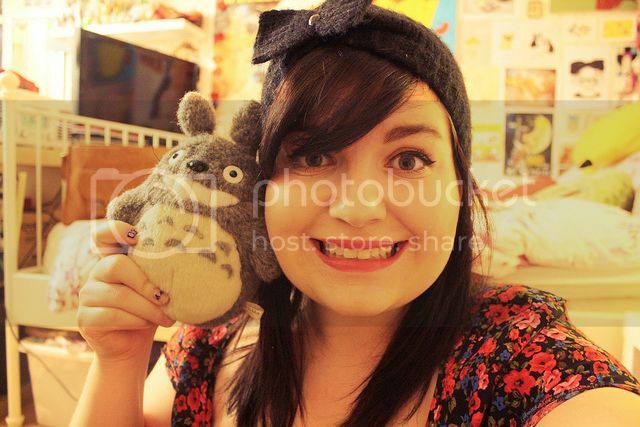 When I discovered her blog, it was a case of INSTANT girl crush! She has a fabulous rockabilly punk look, and I love all of her body modifications. Funnily enough when I commented revealing my undying love (sort of), I discovered that she reads this blog too! Small world, the blogosphere. 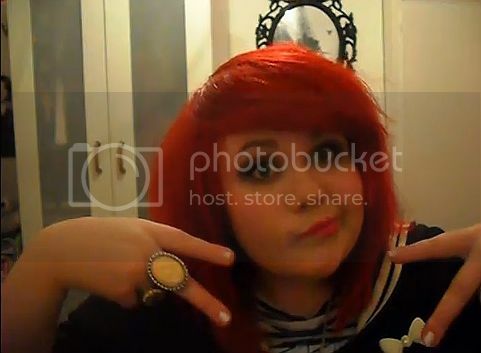 She's also just had her birthday, so go and wish her many happy returns. Teehee! Willow Rosenberg (Alyson Hannigan) from Buffy The Vampire Slayer. I'm just starting to rewatch my Buffy boxset again from the start, and my favourite series are definitely the first three, which are set at Sunnydale High School. Willow is Buffy's loyal best friend who eventually makes the transition from promising science and computer nerd to a powerful (and sometimes dangerous) witch. And that's your lot for this week - if you have any suggestions, as always I'd be love who you're girl crushin' on! I found out this week I made YouTube partner, so I'm going to try my best to make more vlog-style videos for my channel. This one is a recent haul video featuring Urban Decay, NYX, Stila, ASOS and Domino Dollhouse (you can see the dress better in this post). If that doesn't entice you enough to click the video, I've also included some bloopers at the end, as I AM AN AWKWARD TURTLE. 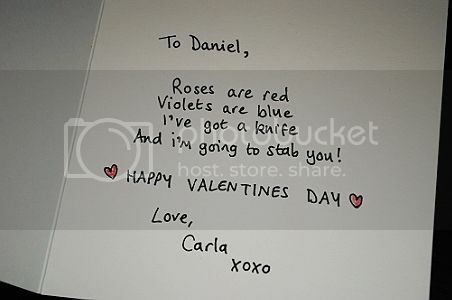 That's me being "x_SCENExCORE_x CARLA". Oh yes. Sorry for the short post today, but I'll be back tomorrow for Girl Crush Wednesday! 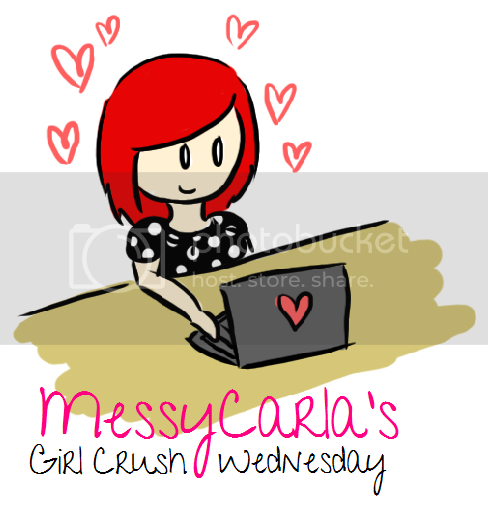 I'm really pleased so many of you liked the Girl Crush Wednesday idea so much - it's going to be lots of fun methinks! Earlier this week I went with my friends Sam and Ashley to see the band Mike TV who had a free show in Newcastle. POINT OF FASHION: Black, white and red. Apologies for the rather rubbish quality picture - I feel like I'm taking it back to old school outfit posts as I would nearly always pose next to my door! But it was late and I had to shoot this with my light blaring, then try and sort out the white balance in photoshop - which has also made my hair look really dark. Booo! Anyway though, even though it was a punk gig I went for a bit of a cutesy mod girl look with clunky vintage heels and red lipstick. I'm not used to wearing long sleeves though, so I ended up rolling the sleeves and wearing a crop black cardigan on top. 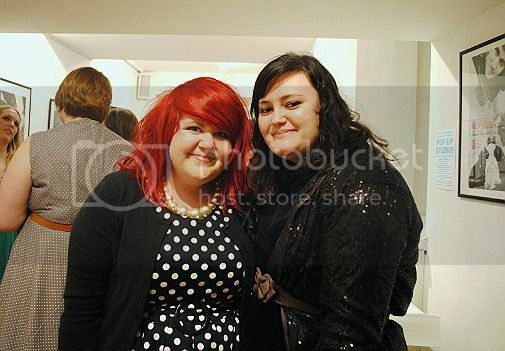 My friend Sam turned up wearing a similar dress (although her polka dots were actually teeny tiny white apples - so cute!) which the band noticed and told us we reminded them of The Pipettes! Best compliment I've had in ages, really - teehee! 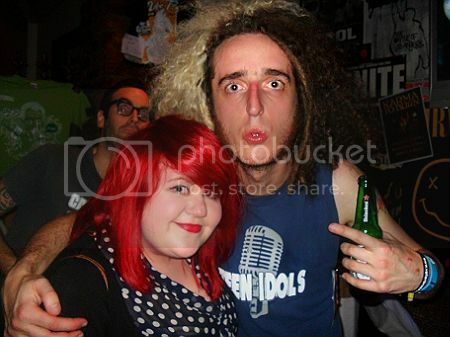 I love Trint from the support band Uncommonmenfrommars photobombing! They were really ace too, especially when they did a Screeching Weasel cover. See, I told you my hair is still bright! Although my sister's camera made me have a crazy eye - I didn't feel like lugging my DSLR around when there was dancing to be done. In other news, if you follow me on Twitter you'll know I've had a few job interviews the past week, and I was told today that I got it! Hoorah! I've been unemployed since Autumn, so I'm absolutely chuffed. Daytime TV is actually destroying my life! I'm very excited for our next show this Sunday, as we're broadcasting from one of the presenter, Lee's house and we're calling it Come Mince With Lee. Please be sure to listen live if you can from 2pm GMT on http://www.prideradio.co.uk/. I've been looking forward to telling you all about the new series staring on this blog. From now on, we'll be curing our mid-week blues with Girl Crush Wednesday! This is basically a celebration of fabulous women I'm majorly girl crushin' on - and hopefully we'll all end up crushing and fangirling together. Thanks to Rai who did a great job with the graphic! Claire of French For Cupcake. The real question here is when am I not crushing on Miss Claire? We've been online buddies since Ye Olde Days o' Livejournale, and started our blogspots around about the same time! Her blog is full of beautiful outfits and delicious cake - amazing combination. Angelina has recently started updating her hilarious YouTube channel more often - giving hilarious yet completely on the money commentary on body modifications, "real women" and inapropriate Katy Perry album tracks. I love how she always makes references to a fictional hater called Laquisha! D'awwww who doesn't love Lily? Even Madonna's daughter is a fangirl! I just adore her style, and am way jealous of her dollygirl looks. Grrrr. 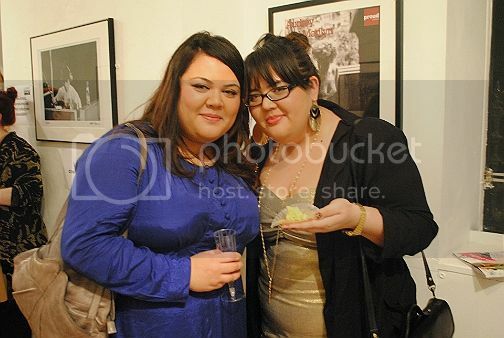 I bumped into her at The Look Show last year and she's just off-the-chart adorable. I'm always going to be open for suggestions for this new feature. Think there's a girl everyone should be crushing on? A blogger, youtuber, musician, fictional character? Just let me know! If you've been living under a log for the past few months, you may not have heard of the fabulous Domino Dollhouse - an affordable online boutique for curvalicious ladies, run by the fabulous Tracy of Chubble Bubble, whose sassiness simply floors me. Me and Lauren were recently having a discussion about plus-size fashion, and how sometimes it feels like the majority caters for an older demographic to us in our early twenties. Enter Domino Dollhouse - all their peices are cute, punky and reminds me of how Torrid used to be when it was BFFs with Hot Topic. And affordable? VERY. With dresses starting at just $18. Tracy was kind enough to send me this Flora dress to review, and I absolutely adore it - it's easily one of the best fitting dresses I've had in ages. It fits perfectly over my chesticles (with no squishing occuring - the girls can breathe! ), nips my waist and flares out over my hips without clinging at all. POINT OF FASHION: A punky tea party. If you'd like to try Domino Dollhouse for yourself, they very kindly sponsored Plus London and are offering a voucher code to EVERYONE! Simply type in PLUSLONDON at checkout to recieve 20% off your order, worldwide. 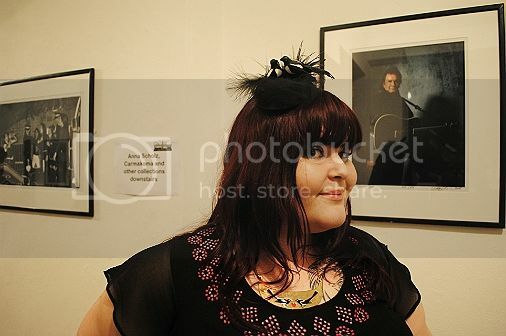 In other news, I mentioned a few weeks ago that I am getting my MODEL GRRLZZZZ on for local photographer Mandy Charlton for her 'Dressing Up' project. She simply asks her subjects to come "dressed up" with no other instruction, and it's so interesting to see how this is interpreted! Some people have turned up in fancy dress, others top-to-toe in 1940s vintage. 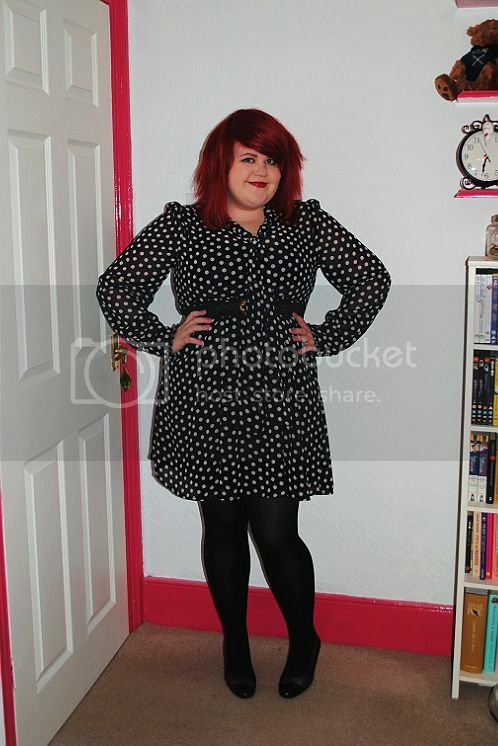 I went for my favourite outfit of a 1950s style polka dot dress, faux pearls, crop cardigan with corsage, and high heels. 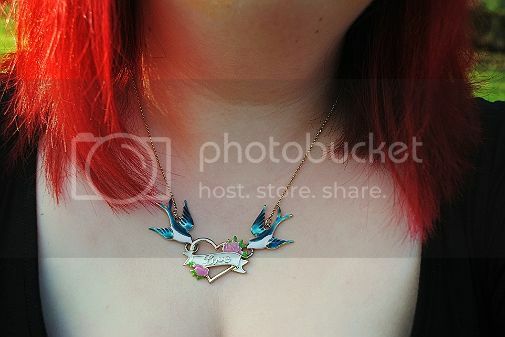 The reason I haven't shown you these pictures yet? 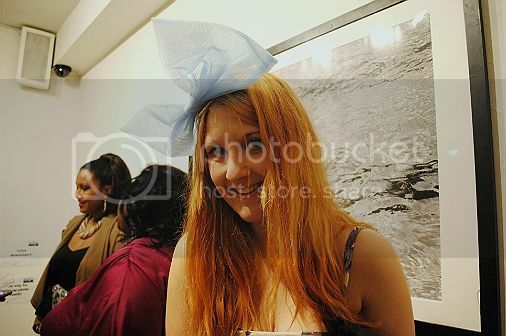 Why, I wore this to the evening event of Plus London of course! And it would not do for me to turn up in an outfit you'd already seen now would it? Teehee. 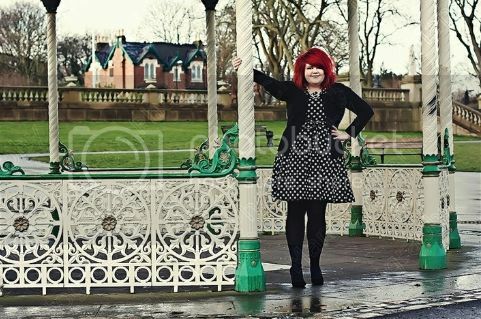 We shot these at Leazers Park in Newcastle, a place that always makes me smile as during my last summer with my friends before I left them for college (they all stayed on at the sixth form) we basically lived here - making dens in the bushes, climbing trees and terrorising the children in the play park. Good times! 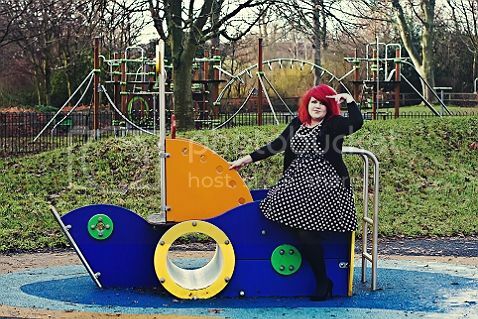 The first was taken in the play park, and is me trying my very best (and failing miserably) at being nautical pin-up chic. It was SO much fun though, and it was ace how Mandy and I clicked straight away - we even went for a coffee afterwards as we had so much to natter about! North East creatives are the BEST! Finally, if you are reading this between 2pm-4pm today (Sunday 13th Feburary), you can check out mine and Daniel's radio show over at http://www.prideradio.co.uk/. This week, the theme is Independent Anthems, as we're both single this year! There's going to be lots of fun pop tunage and our usual witty (on his part, anyway) banter - so please listen and feel free to get in touch during the show. We'll be happy as ever for any shout outs and song requests! It turned out at Plus London he has legions of fangirls, so go and give him so love. Somebody should, really. PS: Oh, and thank you to everyone who has followed my 365 Tumblr - I've been very good and updated every day so far. Thank you for your support! I really need your help... It's a bit cheeky but I'm desperate now! It's my 18th birthday next month and I'm completely stuck on what to wear...So I was wondering if you could help me? I'm a size 14/16 on top and 16/18 on bottom and 5'4 too! I always wear baggy tomboy stuff like hoodies, jeans, t shirts, boyfriend cardigans, nothing very exciting. 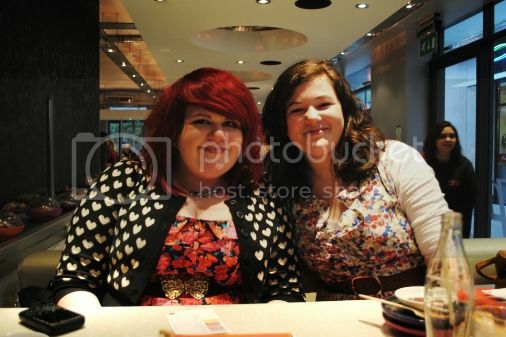 But it's my 18th, we're going for a meal, and I just want to look really nice for once. I'm thinking something different to what I usually wear... like a dress or top and skirt? I really love what you wear on your blog so I'd really appreciate if you could give me any advice or tips. I completely and utterly understand, Emily. Until I was about seventeen, I was very much a tomboy! I lived in jeans and grubby band t-shirts, and rarely wore makeup at all. So making the transition to a more grown up and glamourous new look can be a bit daunting. I'm not really a believe in 'capsule wardrobes' - I'm more of a 'have lots of clothes and have fun with mix-and-matching' kind of girl. When you're so used to wearing jeans and t-shirts, suddenly having your arms and legs on display can be a bit daunting - so start off with a simple black dress. 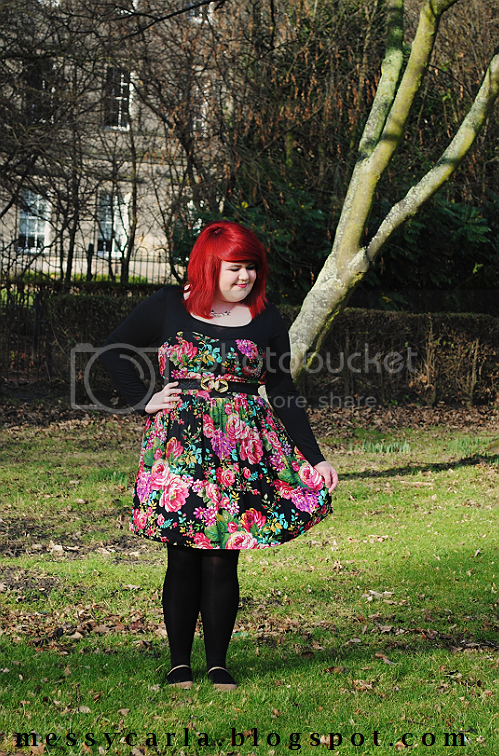 I love this structured empire-line dress from New Look. It will nip your waist (my waist is the smallest part of my body - surprisingly - so I tend to go for this shape a lot!) and flare out, making it seem a lot fancier than it actually is. The neckline is sweet and demure and will look fabulous dressed up with some short or long faux pearls (most high street stores stock these!). 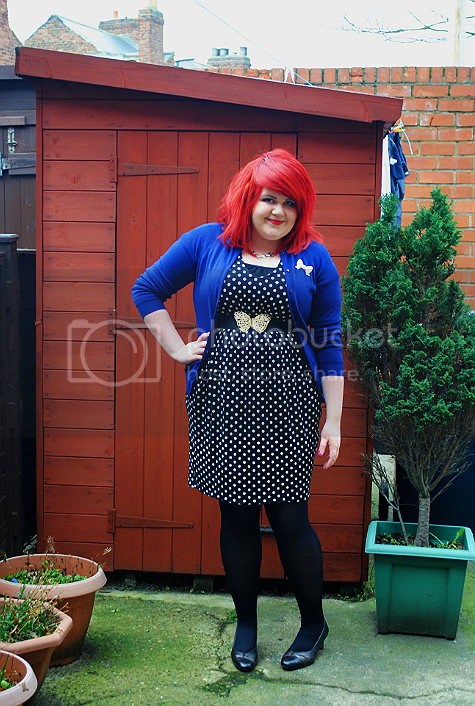 If you're unsure about baring your arms, you can wear a cute cardigan on top. I'd suggest a cardigan cropped at your waist for an evening event, which looks very Chanel chic. However don't throw away your boyfriend cardigans - you can pair them with your new dress and ballerina flats for more laid back look. Perfect if you are planning on a cheeky pub date with your friends to celebrate turning eighteen? A nice pair of black high heels will go with lots of outfits - you don't have to go as high as the ones on the pictures, don't worry! Finally finish off the look with some black eyeliner and red lipstick. My favourite black eyeliner is by Barry M, and my favourite red lipstick is Fire by Chanel. But if you'd like to experiment with a 'drugstore' brand, Revlon do some lovely red shades. Remember first and foremost than experimenting with your look should be fun - try not to stress out too much, and I do hope you enjoy your eighteenth birthday! Have you ever taken a big plunge with the way you dress? before a party at The Strand Gallery in the evening. 1. Me and Miria have a fabulous taste in cardigans! 2. Finally getting to meet the darling Maria who I feel like I've known forever online! 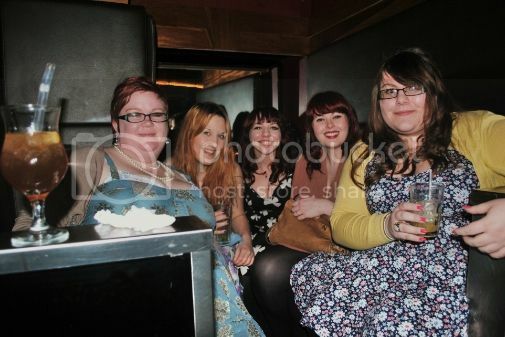 From L-R: Claire, Amy, Sarah, Ellie and Jade. EPIC FANGIRLING on my part! 6. I was SO excited to meet Nadia, as she's been a follower of this blog from the very start - and I was one of her first readers too. 8. Mel and her sister. They're so beautiful - and very sweet! 9. 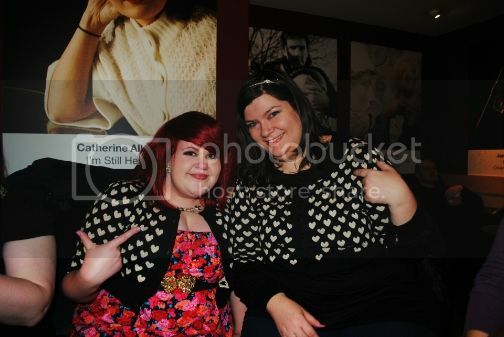 Amy is so bloody gorgeous and I loved her oversized bow. I fangirled a bit, too! 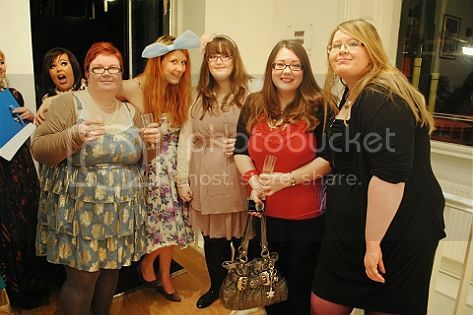 Claire, Amy, Georgina, Wendy and Lauren - with an EPIC photobomb from Naomi! It was also Georgina's 21st birthday! 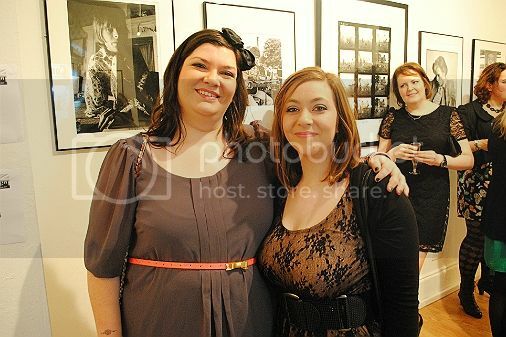 (FYI: If you'd like to use any of the photos - please feel free, but link back to my blog! 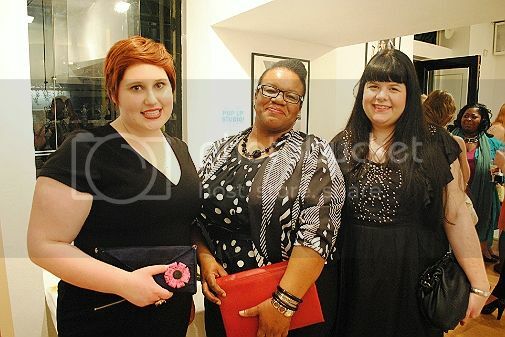 There's going to be some more photos surfacing as people begin writing their posts about the event - plus we also had official photos taken by Geoff and Diana of Fashion Loves Photos (who I developed a MAJOR girl crush on!) and The Second Floor Studio. At the end of the evening, I was elected to make a speech about Lauren and her general fabulousness, but I was a bit wobbly on my heels and afformentioned fizzy pop - so I passed the flame to Miss. Ding, who made a bunch of us well up. Oh us writers are such an overEMOtional bunch aren't we? Honestly, the event could not have gone any better - everyone got along so well, and I've never been so proud to be part of such a tight-knit community. Amanda told me at one point, how she feels like part of a sisterhood - like we're all for one and one for all. I also found it interesting when she said how the event felt less about a celebration of plus-sized women, but more as a celebration of women of all shapes and sizes. And that's a thought to keep a hold of! Thank you to everyone who attended the event, it was amazing how everyone clicked straight away and hearing everyone's stories and thoughts about why they choose to blog. Even if you didn't attend - thank you to everyone who wishes us luck and tweeted - believe me, you're a part of this, too. In the words of my friend, Daniel (who had an obscene amount of fans at the event...) - Arms in the air, everyone! EDIT: Oh, I'd also like to post this video in honour of Anika.